Young couple in beach chairs read a book together, Brighton Beach, Brooklyn, undated (ca. 1920). William D. Hassler photograph collection. New-York Historical Society, 25833. Join us for our Members-Only History Book Club, meeting four times between October 2018 and April 2019! Get to know your fellow N-YHS Members, discuss various aspects of history and art based upon books that correlate with our current exhibitions, and engage in meaningful and enlightening conversation with fellow New Yorkers. This program is an exciting way to participate in a series of casual yet thought-provoking forums. 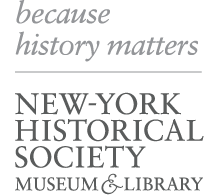 All meetings take place from 5:30 – 7 pm at the New-York Historical Society. Sandra Krystal is the discussion leader of the New York Historical’s History Book Club. She has taught English literature in New York City high schools, trained teachers for the NYC Board of Education, and conducted training workshops in both the business and educational world. Currently, she supervises student teachers at Hunter College. It is her passion for history that spurs her to perpetuate the book club at the New- York Historical Society.